Having experienced a loss of interest in flying model airplanes, I thought perhaps that the purchase of a Hangar 9 CubCrafters XCub 60cc ARTF at the end of last year might Ginger up my enthusiasm. Unfortunately this has not proved the case, largely due to the poor design and presentation of the kit. The model is designed for electric use or petrol IC (Horizons 62cc Evolution) and having suffered one Evolution engine, I elected to go to my manufacturer of choice and fit the OS GT 60cc. This presented a problem regarding the position of the throttle servo, as the orientation of the carburettor controls is different from the Evolution. This has proved a bit of a hassle to say the least. I tend to get quite bored putting planes together so generally only manage an hour at a time; so at only a few hours a week it’s taking awhile. This is where I’m Up to so far. I put the transmitter in the shot to illustrate the size of the tundra wheels. The model comes with a tow release which I have fitted. The tail controls are in a compartment in the bottom of the fuselage, probably so that they are not visible in the cabin. The wing struts which are not fitted in the photo are not as well done as those on Hangar 9’s 1/4 scale Cubs which will make transportation difficult. All in all I’m beginning to wish I had not bought it. I suspect it will fly well, so its just a question of if I finish it before the end of the summer. 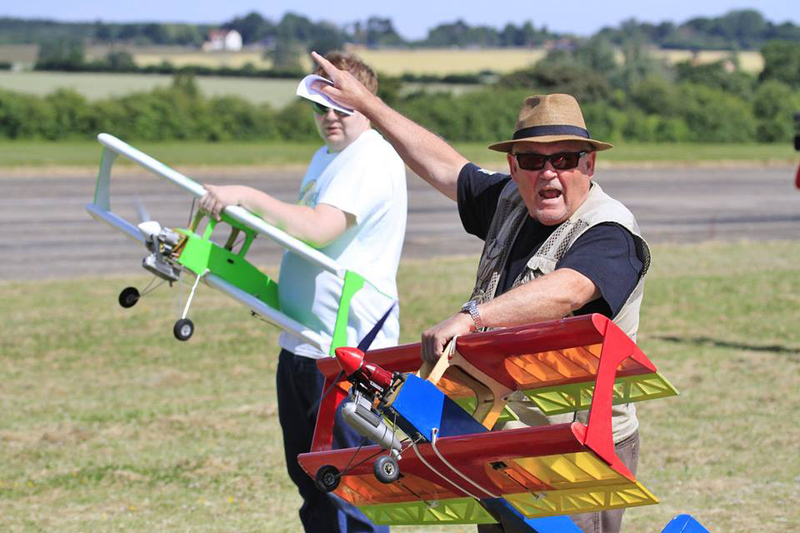 Kevin East had his Futura scrutinised and got his certificate allowing it to be flown at the field, which he did. Great displays. Thank you Don Fraser for the photograph. Most of the usual Tuesday crew were present for a pleasant day although the wind got a bit chilly by mid afternoon. The two Alans marked out the runways. Looks great, thanks chaps. 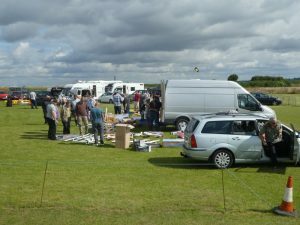 Weather was kind and the event was well attended. I’m sure a number of people learned a lot and went away with a much better idea of what is required and how to do it. Taylor Veasey was there, getting to know his petrol powered Wot 4 XL which he plans to use to do his ‘B’ when hes good and familiar with it. Thank you to Bob Ryan, Steve Brett and Dave Warren for what turned out for them to be quite a long day. Stewart Keeble is selling his JR XG14 Tx, it comes with two 6 Channel Receivers, charger and manual and is Telemetry ready. All in original box. Stewart is looking for £200. Popped up the field yesterday to watch Jon fly his Stearman. He had made some adjustments and found that it flew much better. The grass looks marvellous after the work that the Alans did on it last Friday. All the grass has been cut with the runways clearly defined by being shorter than the remainder, but in truth you could land or take off anywhere except with something with very small wheels. It was boardering on hot with little or no wind, very comfortable watching in just a tee shirt and jeans. The good news is that our flying field is not affected. On 13 March 2019 the drone flight restriction zone around airports and airfields changes. The government has introduced a new rule stating that the 1km restriction from the airfield boundary is replaced by a restriction using the airfield’s existing aerodrome traffic zone, which has a radius of either two or two and a half nautical miles and then five kilometres by one kilometre zones starting from the point known as the ‘threshold’ at the end of each of the airfield’s runways. Both zones extend upwards to a height of 2,000 feet above the airfield. It is illegal to fly any drone at any time within these restricted zones unless you have permission from air traffic control at the airport or, if air traffic control is not operational, from the airport itself. The grass is being cut tomorrow Friday 22/2/19. We will work around anyone that wants to fly.